Christ the King Lutheran Church owned a 200-seat church building, a two-story parsonage and more than six acres in Flint. What the congregation lacked was members. Over the years, some moved away and others died. Those who remained did not want to close the doors. In 2005, five or six remaining members found a unique way to keep the door open. They gave the church to a deaf congregation that met in the building. It became Christ the King Church of the Deaf. Hearing members of the former congregation still participate, but the church is owned and run by the deaf. “There is no debt, six and a half acres of land and a house for the pastor, all supported by the deaf people,” Engel said. “They’re the leaders.”Owning a church is unusual for a deaf congregation, according to the pastor, the Rev. Brant Engel. Most deaf churches are subsidized; this one is completely self-supporting. Engel came to the deaf congregation in 2003. He signs as he preaches during 9 a.m. Sunday worship services. An organist accompanies the hymns, which are sung by the hearing and signed by the deaf following song leaders who gesture in American Sign Language. On Reformation Sunday, Oct. 31, both Engel and co-pastor the Rev. Thomas Dunseth participated in the service and a deaf choir signed the hymns. After the service, the congregation moves to the fellowship room in the basement for refreshments. Dunseth then leads a Bible study, attended primarily by the deaf. The bilingual services help the deaf include hearing friends and family members in the worship service, according to Gerald Last, who comes with his father, Norwin Last of Clio. Initially, the deaf congregation worshiped at St. Paul Lutheran Church of the Deaf, which met on the campus of the Michigan School for the Deaf. When the pastor left in 1983, the congregation moved, due in part to concern for separation of church and state. 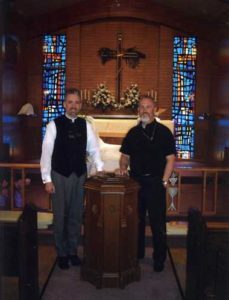 Members met with an interpreter at St. Paul Lutheran Church, and later held separate services at Christ the King Lutheran Church. The Lutheran Church has always had an interest in the deaf, Engel said. He recalled his grandfather’s involvement with the Lutheran School for the Deaf in Detroit, which inspired his own interest. He began to pastor deaf churches as a seminary student in 1981. After graduation, he lead deaf churches in Pennsylvania, Ohio and Michigan, and came to the Flint congregation in 2003. He also teaches physical education at Mumford High School in Detroit. Dunseth, the co-pastor, began a ministry for the deaf while serving as a missionary in Macau, China. Four times a year, he returns to encourage the believers there, and also consults with Lutheran ministries for the deaf in Michigan. He shares pastoral services with Engel, and holds a Bible study in sign language at the church at 11 a.m. Wednesdays. Both pastors also care for Our Savior Lutheran Church of the Deaf, which meets at Our Redeemer Lutheran Church in Birmingham. They set up a small group of deaf people in Traverse City in 2003. Another pastor took over that work in 2006. The Flint church is entirely self-supporting. Most of the 35 members live in the Flint area; others drive in from Saginaw and Milford. Five or six hearing persons come each week. After her husband’s death, the pastors led his service in both sign language and voice. I was sitting there, enjoying a great fish fry in the basement of Zenders with some of the folks from Christ the King Lutheran Church For the Deaf in Flint, MI and a few more from Our Savior Lutheran in Birmingham, MI. We were signing together and having a great time. Then we went outside. Waiting for us was a 14 passenger bus with a wheel chair lift and it was for us! This was more than I could take in. The Deaf people with us were very excited. This was their new bus. But how did it get here and who had paid for it? Ephphatha Lutheran Mission Society (ELMS) has been working with the Deaf since 2003. The goal of this mission is to reach out to the Deaf community with the Word of God. Recently, ELMS received a grant from the Michigan District LWML and the Church Extension Fund to buy a bus for the Deaf community in these areas. ELMS quickly found a bus in great condition with all of the needs of the Deaf community in mind and bought it with this grant money. But why the bus? One of the first priorities in any community is group events. This is no less the case for the Deaf community. This bus is the first of many ELMS projects to begin bringing the Lutheran Deaf community together. It gives ELMS an opportunity to provide and attend more events with Deaf church members. While we were returning to our cars after we had taken a ride in the bus, there was a general consensus, this is a great gift. Thank you to all of the LWML ladies in the Michigan district and our friends at CEF who provided for such a wonderful gift to the Deaf community. ELMS will continue its mission serving our Lord’s Deaf children, bolstered by a new boost in transportation.